Year 2016 karting season have ended, the final stages also and has been quite a big break, to rest, to assess the progress made and once again get that missing feeling after the next trip with your kart. However, to fully end a great season this year and highlight in future targets for the next, we invite you to the wonderful season Award celebrations – on 26th of November, in Riga, at art space "Dizaina Fabrika" / Slokas Street 52d. Sincerely will welcome and rewarding all the 2016 Karting season and Minikāri winners! Entrance awards ceremony will be open from 17:00 pm., while the ceremony beginning at precisely. 18:00 pm. Event official part of the planned duration from 18:00 pm. to 21:00 pm. 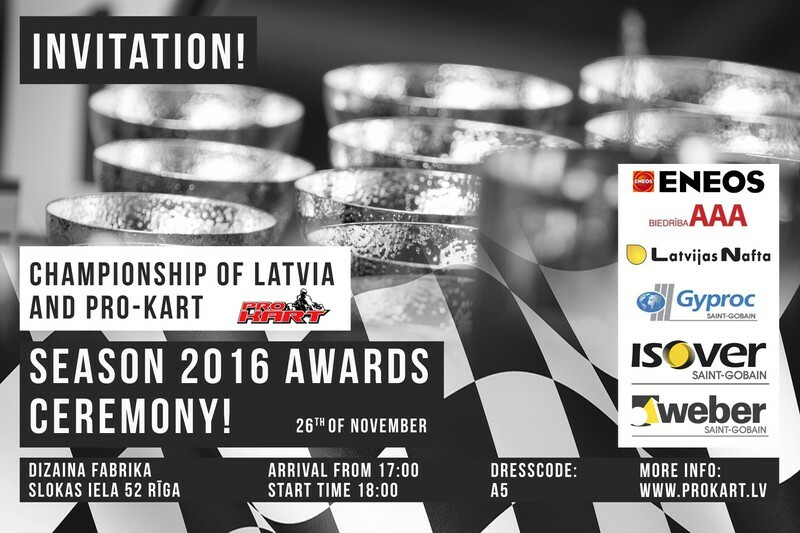 Event Dresscode: "A5"
The Awards ceremony rewarding Latvian Championship Minikāri, Figural driving stage, Latvian Karting Championship, Latvian Rotax Challenge Cup winners, as well as, of course, the Pro-Kart stage the best total score winners. Event manager this year will be a sports enthusiast, LNT sports news journalist and exciting personality - Lauris Lizbovskis. The whole course of the evening for musical accompaniment will take care DJ Mareks Motte, in turn, gorgeous world hit and jazz delight us a great singer Alice Kante. It will take place in various competitions and will be able to look at the best photos from a selection of last season, which is going to offer our photographer - Mārtiņš Jankovskis. After the official part of the event before 3:00 will be followed by a fun party, where for the musical accompaniment will take care also great DJ Mareks Motte. There are now launched an invitation in advance - of 25 EUR per 1 invitation, while the evening on Award ceremony invitation price will be 30 EUR. We remind you that minor nominees will receive 2 invitation - for yourself and one companion, while drivers of age will get only one invitation - himself! Invitations can buy at the LAF Karting Commission president Valdis Brutāns, after contacting him. Phone: +371 29532998. Get your dresses, suits ready and come only with a great mood and we will meet You on 26th of November, at Dizaina Fabrika!